What an unbelievable slide it adds a touch of nature and fun and makes you feel like you have left the rat race. This is a big, tall, and long slide. You really need to see this. Any Slide over 20 foot must have drive up access to the setup site. These slides need a large flat area, and can only be setup on a surfaces that support secure staking into the ground. Concrete and asphalt are not suitable for setting up large slides. JumpMaxx has worked hard and long to provide to you the most unique and wonderous inflatable products to entertain your family and guests at any party, event, and fund raiser. How else can Tucson, Az keep its cool in its unbelievable heat other than a trip to Mt Lemmon? 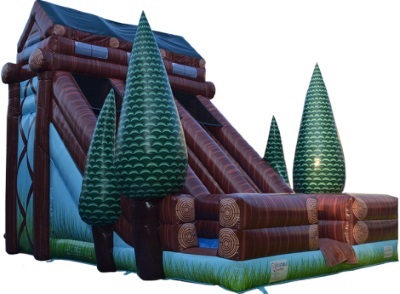 JumpMaxx prides ourselves in providing America with newer, cleaner, high end entertainment with inflatables like the 25 Foot Log Cabin Slide and many others.